Why Do We NEED a Church? Why do we need to meet every Sabbath? Is it important? How much do YOU need the Church? Read the answers in this article. 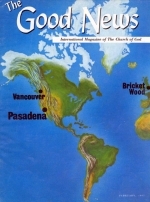 SOME members reading this issue of The GOOD NEWS magazine at this moment do NOT attend weekly Sabbath services at their local church! Some of those attending, come under protest, it seems. Others come in the hopes of hearing something new. And yet others come because they are afraid NOT to! Many are worried about what their relatives might think and some claim that they are under the authority of their husband and cannot attend! Brethren we are the people of GOD! We KNOW that we are the True Church established by Jesus Christ, almost two thousand years ago, yet many cannot see the importance and significance of attending Sabbath services! Each one of us NEEDS the Church! Every person who calls himself a Christian is COMMANDED to attend wherever physically possible and practical! Notice the commandment in Leviticus 23, verse 3: "Six days shall work be done: but the seventh day is the sabbath of rest, an holy convocation; ye shall do no work therein: it is the Sabbath of the Lord in all your dwellings." The word "convocation" means "commanded meeting or assembly," and when used with the word "holy" it means "for a holy purpose." The Christian is commanded to meet on the Sabbath day and the commandment comes directly from God Almighty! Many times we do things within the framework of God's Church, without really knowing WHY! We just trust the ministers and those over us without fully grasping the significance of certain actions. Some of us may feel that when the weather is hot and sticky we would be better off studying by ourselves in an air-conditioned home rather than traveling to the Church, which may be a little hot and uncomfortable. We may not like the minister. There may be others there we don't get along with very well. Perhaps some may feel their clothes are not nice enough. Are these valid reasons, brethren, or aren't they rather excuses! God has many reasons why we should and must keep the Sabbath; let's examine three of them in relation to church attendance and see if our own attitudes stand up to the scrutiny! Just prior to Christ's ascension to the Throne of our Heavenly Father, He gave the Apostles a great two-fold commission. Notice, that in Matthew 28:19 He commissions the Apostles to preach the Gospel as a witness to all nations (see also Matthew 24:14) and in John 21:15-17 instructs Peter to "Feed my sheep." The work of preaching the Gospel as a witness is being done through the media of The PLAIN TRUTH and The WORLD TOMORROW broadcast. The "sheep" are being fed through the Church established by Christ Himself (Matthew 16:13-20) and pastored by His true ministers! This aspect of feeding God's people is very important! Notice the apostle Paul's attitude in addressing a group of elders in the Ephesus Church of God. "Take heed therefore unto yourselves, and to all the flock, over the which the Holy Spirit has made you overseers [elders, ministers} to feed the Church of God which He has purchased with His own blood" (Acts 20:28). His instructions to the young Evangelist Timothy were in the same vein — solemn, and charged with great responsibility. "I charge thee therefore before God, and the Lord Jesus Christ, who shall judge the quick and the dead at His appearing and His Kingdom; preach the Word; be instant in season, out of season; reprove, rebuke, exhort with all longsuffering and doctrine. For the time will come when they will not endure sound doctrine; but after their own lusts shall they heap to themselves teachers, having itching ears; and they shall turn away their ears from the truth, and shall be turned unto fables" (II Timothy 4:1-4). There is a great and heavy responsibility on a minister to preach the Gospel of Jesus Christ to the Church of God. Failure in that commission could lead to a large number being enticed away by false ministers. But the responsibility is also upon every single Church member to be there when this message is being preached! We must know that it is possible to be led astray by lying and deceitful men, and learn how to resist! The truth of God acts as a shield and defense against the doubts and falsities of Satan's teachings! The apostle Paul likens a knowledge and study of the Truth to putting on a full suit of spiritual armor (Ephesians 6:11-17). Unless we are there every Sabbath, or as often as is humanly possible, to receive this teaching from God's ministers who are inspired and led by His Holy Spirit, then our lives may be IN GREAT DANGER! Too many of God's people take these God-ordained services too lightly and carelessly, forgetting the admonition of Peter to "be sober, be vigilant; because your adversary the devil, as a roaring lion, walketh about, seeking whom be may devour" (I Peter 5:8). One other point: Do not expect to hear "new truth" preached every time you attend church! This will generally come directly from Headquarters via The GOOD NEWS after approval of Mr. Herbert W. Armstrong, and discussion at a high ministerial level. To seek "new truth" constantly is a dangerous thing and leads to vanity of mind and an "independent spirit." Notice, for example, the attitude of those who Paul encountered in Athens in Acts 17:18-21! Sabbath meetings are primarily for exhortation, rebuke and teaching "with all longsuffering and doctrine," exactly as Paul instructed Timothy. Remember, brethren, we NEED to be fed the unvarnished, plain truth from the Word of God, and this is the only place to receive it! Another vitally important reason why we NEED the Church that God has set up is that of fellowship with those whom God has called out of the world. "We know that we have passed from death unto life, because we LOVE THE BRETHREN. He that loves not his brother abides [remains] in DEATH" (I John 3:14). The question is: HOW can we love one another unless we KNOW one another? Love is OUTGOING concern for others. Love is essentially a social expression; it can only be expressed in actions, in DOING THINGS for others! True Christian love must have FELLOWSHIP with those of a like mind — and this can only be done in a social environment. In other words, to really learn to love someone in the Church you must come to know that person, and Sabbath services is the best place to do that! Some may say: "But I do PRAY for the Church, even though I don't attend." But how sincere and deep are the prayers of one who doesn't fully know about what or whom he is praying? Compassion, feeling, understanding and pity come from a close personal contact with the problem! One reason why there is a visiting program in every church area is so that God's ministers can cane to know YOU personally, in depth, and thereby help you with your problems! Personal contact is a vital part of Christian living, and some are neglecting this part by staying away from Sabbath services! "Hereby perceive we the love of God, because He laid down His life for us: and we ought to lay down our lives for the brethren" (I John 3:16). But how can we lay down our lives for the brethren unless we know them? And how can we come to know them unless we are fellowshipping on the Sabbath? The degree of a person's conversion and dedication to God is indicated by how much his heart is in God's Work and Church! This is a proved and tested FACT! It is evident to many of God's ministers that the person who leaves Sabbath services immediately at the end of the preaching portion, is usually on the "fringe area" of the Church, in general. This doesn't refer to a person who MUST go because of an unconverted mate or a pressing engagement, but one who WANTS to leave because he doesn't like to be around "people." Are you the FIRST person out of the Hall on the Sabbath? Are you practically at the door before the final "Amen"? Then you are missing out on one of the most important parts of the whole service — fellowship with the Body of Christ! "Let us hold fast the profession of our faith without wavering; (for he is faithful that promised;) and let us CONSIDER ONE ANOTHER to provoke unto love and to good works: not forsaking the assembling of ourselves together, AS THE MANNER OF SOME IS; but exhorting one another: and so much the more as ye see the day approaching." This was the exhortation of the apostle Paul to the Church at Jerusalem (Hebrews 10:23-25)! There were some there who were not attending regular Sabbath services, taking lightly the preaching of God's ministers and the fellowship with others! The result was that when persecution came upon them they were split and divided — there was no UNITY of love! They hadn't been encouraging each other, and exhorting each other to stay faithful and wait for God's deliverance! The day is fast approaching when the Church of God of this era will be persecuted and tormented by those who hate the message we preach! Will you be identifying yourself with the Church then? Will you be willing to lay down YOUR life for the brethren? Brethren that you may not even know? Before we can inherit eternal life, each one of us is going to be put to the test to see whether we are sincerely overcoming and growing in love. Unless we prove ourselves as overcomers we may not make it into Gods Kingdom, in spite of all the "head knowledge" we may possess! Remember the words of Paul in Romans, chapter 12 and verse 10: "Be kindly affectioned one to another with brotherly love [philadelphos], in honor preferring one another." We are the Philadelphia era of God's Church — the Church of brotherly love! Let us show it in our actions and attitudes towards the brethren of God's Church! We have seen that two prime reasons for a "holy convocation" on the Sabbath are for feeding and fellowship, but there is one other that is just as important. In the twelfth chapter of I Corinthians, Paul is explaining the functions of the Church and the gifts given to it by God. Notice verse 12: "For as the body is one, and has many members, and all the members of that one body, being many, are one body: so also is Christ. For by one Spirit are we all baptized into one body, whether we be Jews or Gentiles, whether we be bond or free; and have been all made to drink into one Spirit. For the Body is not one member, but many." This passage is saying that all who consider themselves Christians, through repentance, baptism and the receiving of the Holy Spirit, are part of the same body of Christ! We have to be a part of the Body of Christ which is God's Church (Colossians 1:24) to be saved and receive eternal life! This is a plain statement of the Bible, yet many are taking such a tremendous truth lightly and neglecting their association with God's Church! If we really deeply realize the spiritual role of the Church, we will be wherever the Church is! Nothing could be more important in our lives than to identify ourselves with that Church! Paul goes on to explain in the same chapter of I Corinthians that God has set various members in the body to fulfill certain functions, yet all are a part of the same body. Every part is beautifully balanced and vitally useful to the working of the body as a whole. He shows why in verse 25: "That there should be no schism [division) in the body; but that members should have the same CARE one for another. And whether one member suffer, all the members suffer with it; or one member be honoured, all the members rejoice with it. Now ye ARE the body of Christ and members in particular." He is saying that a true Christian MUST be where the body is! Every member has a job, and if one member doesn't do its job then the whole body suffers! A true Christian who doesn't attend services affects the whole body! The body is incomplete! A true Christian will be rejoicing when the body rejoices, he will be mourning when the body mourns. A true Christian will be an inseparable, indivisable part of the true body of Jesus Christ! It is outside the scope of this brief article to discuss every single reason and excuse for not attending Church on the Sabbath. It is possible only to deal in principles. You know what is in your heart! The three reasons then are, in summary, first, to be fed the Truth, second, for the fellowship, and third, to be a part of the Body of Christ. These three reasons are basic. If one is missing then the others are negated. If you come simply to hear the preaching, and ignore the fellowship, then you are wasting your time. If you come for fellowship and ignore the preaching then again you are wasting your time. Yes, we do need the Church! Church attendance is vital! Your eternal life may depend on it!